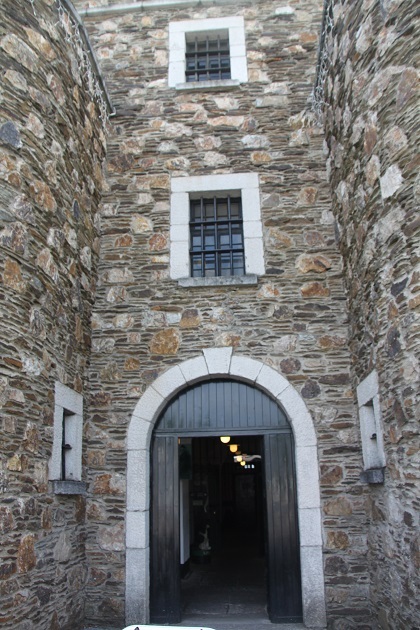 Wicklow’s historic jail was only a thirty minute drive from our hotel. The literature made it sound great and interesting at the same time, we decided this was a must see. Right in the centre of Wicklow town, we found it relatively easily – we paid our 8 Euro each for Husband and me and 5 Euro for Son and stepped inside. The jail was built in 1702 and I have to say, right from the second you walk inside the door it feels incredibly creepy and strange. 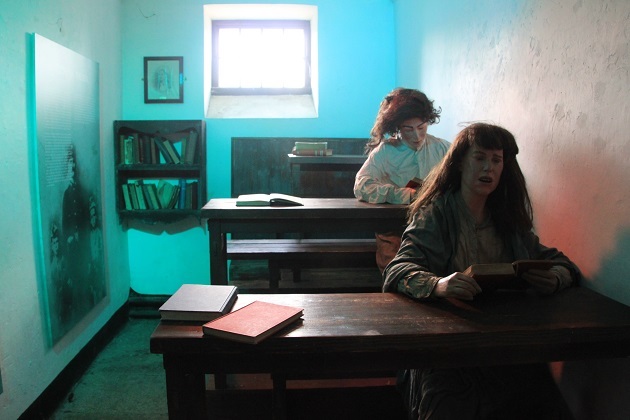 The history is a story of crime, exile and misery, from the Rebellion of 1798 to the horrors of the Potato Famine right up to prison reform and eventual closure in 1900. 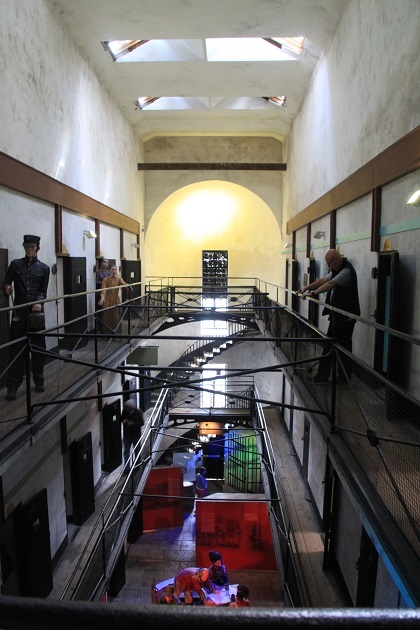 As far as jails go this one is well worth a visit. We were sent through to a waiting room and told our guide would be with us shortly. Son found it all extremely creepy and was none too happy. He and I both nearly jumped out of our skin at a wax figure lying over a table and a very realistic stuffed rat. A group of Irish pensioners came in shortly afterwards laughing, chuckling and full of fun. They messed around with the rats, were super naughty, got up to all sorts of shenanigans and had us in fits of laughter and highly entertained. Never seen anything quite like this, their joie de vivre was wonderful and Son instantly relaxed. 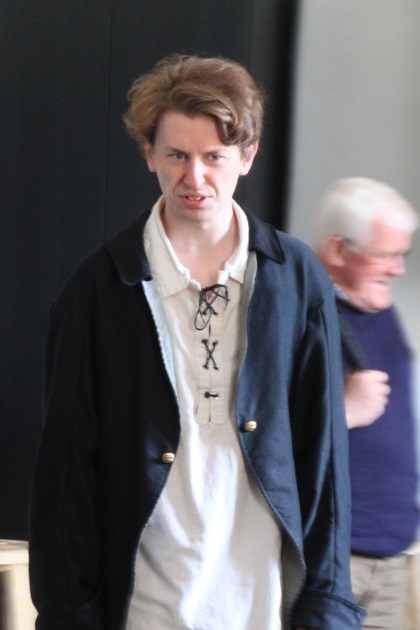 A rather creepy jailer in period costume entered and gave us the run down on the tour. He definitely added to the sense of drama. 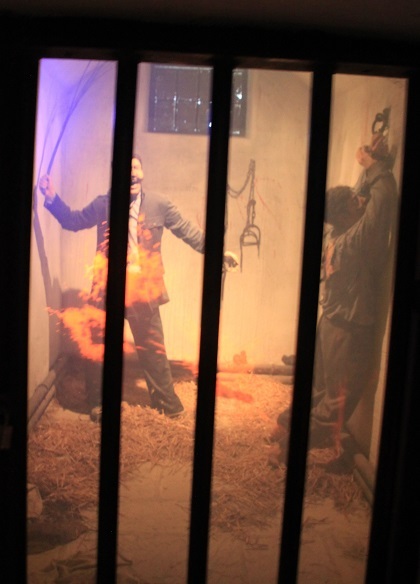 The jail opened to deal with prisoners sentenced under the Penal Laws. 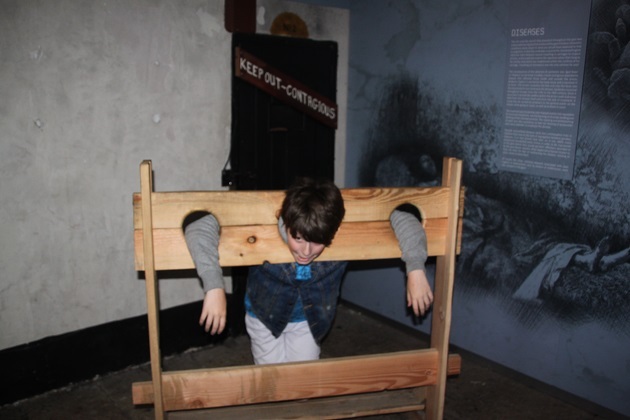 It was renowned throughout Ireland for the brutality of its keepers and the harsh conditions suffered by its inmates. The smells, beatings and disease ridden air have gone but you definitely still get the feeling of what this place must have been like. We headed out to the yard and saw the life size treadmill. 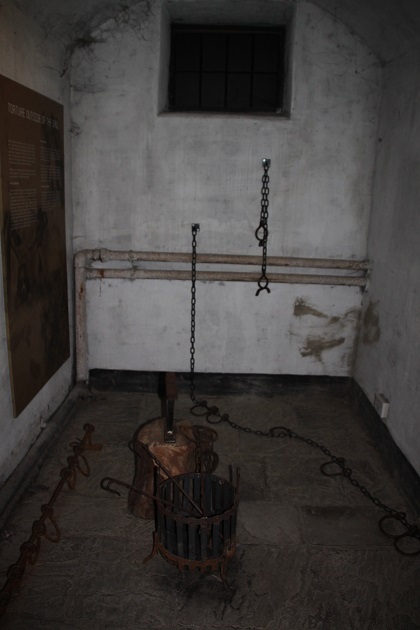 Horrible to hear the prisoners would have to turn this for hours on end as a punishment. We were left to do the rest of the jail on a self guided basis. 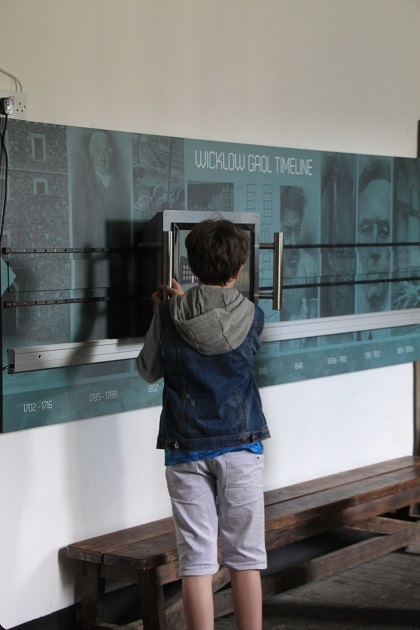 We started in the old cells, each one “housed” a different prisoner and as you entered the cell a sensor tripped and you heard the inmate tell their story. It was fascinating and so well done. 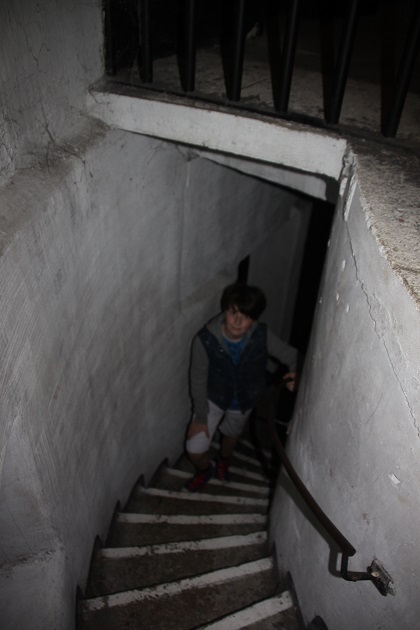 Downstairs they had a recreation of the dungeon – dark, creepy, very spooky and with some grim tales, Son wasn’t keen at all to spend too much time down there. 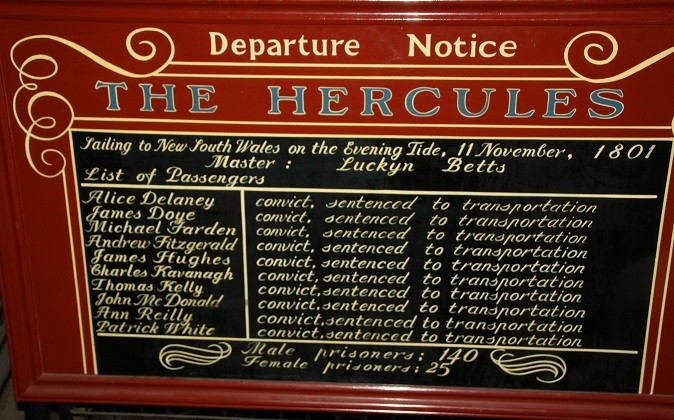 The convict ship Hercules is recreated on the first floor, again very well done. 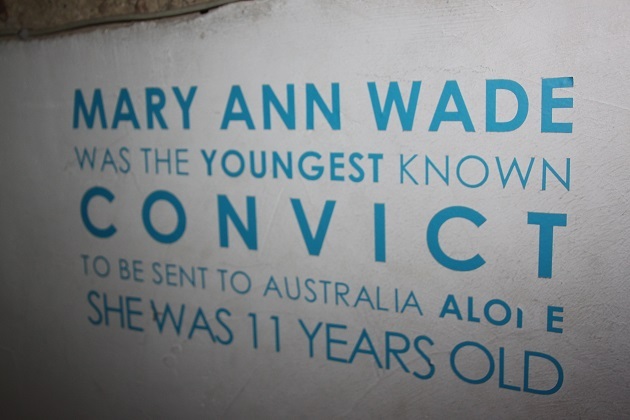 You hear the harrowing story of the many thousands of Irish prisoners deported to prison colonies in Australia as harsh punishment for often minor offences. Luckyn Betts was the captain, a psychotic man who was unbelievably cruel. They said that six months under his iron rule and most began to see death as a form of mercy. We emerged on the top floor of the jail, heard stories of the prisoners once they arrived in Australia and then saw the cells as they were in more “modern” times. 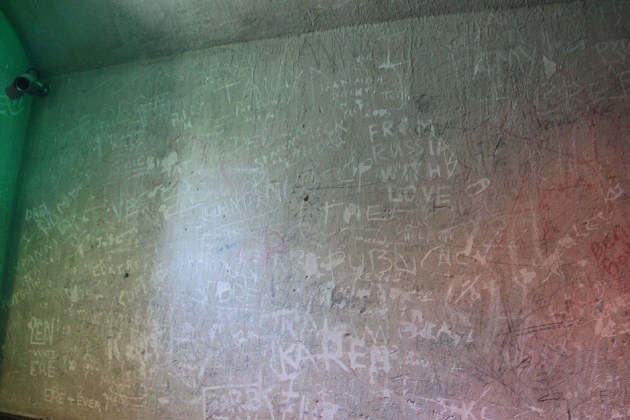 Lots of stories of political prisoners and we saw a cell where children were educated. We heard about prison reform and saw some old graffiti. Son went on ahead alone and came out pale faced and solemn from a cell further along. 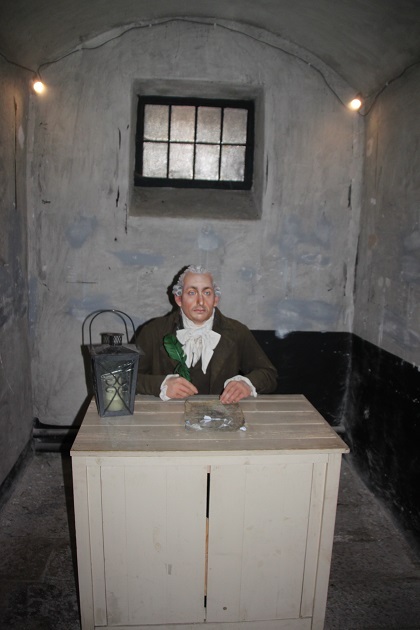 He read in there how many people considered the jail and that cell to be one of the most haunted places in Ireland. Needless to say he was keen to leave quickly after that. It was the last cell so we did. A brief look in the gift shop but none of us were tempted by the gory souvenirs. Our visit here had been interesting and intriguing and more than a bit spooky. What an eerie looking place, Joy. 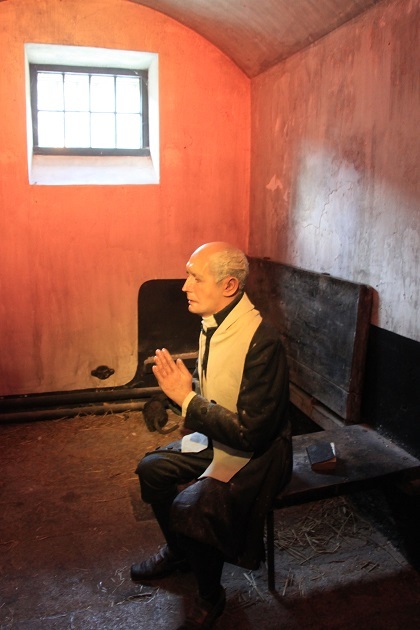 Claustrophobic… and profoundly scary… particularly to hear the stories behind the people who were imprisoned there, and to see those life-like figures standing and sitting everywhere. I’m not surprised your son was spooked. Old haunted jails like that would give me the heebies. 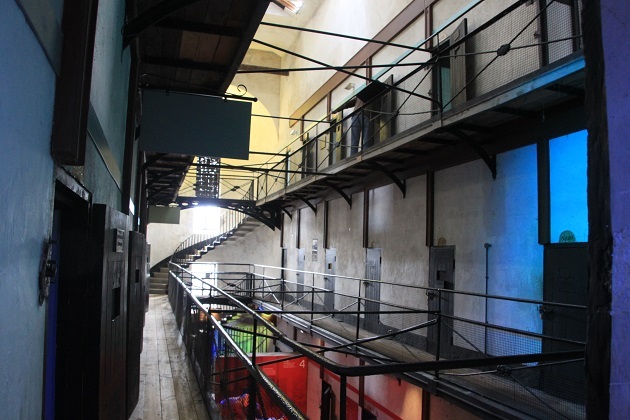 We visited Kilmainham gaol in Dublin, and I also felt very relieved to re-emerge into the open air afterwards. Lucky for the hilarious group of pensioners who arrived just at the right time to lighten your mood! It was so creepy Reggie, I can’t tell you just how spooked we felt as soon as we walked in the door. Those naughty pensioners were just the tonic we needed, I think our son may have bottled out otherwise!! Kilmainham Gaol is another of those places I would like to visit and explore, never been there yet but I’m sure it is pretty creepy too!! My goodness, those wax figurines give me the creeps! What a place 😱 Nevertheless it’s very interesting and I would love to visit. It was so creepy and so spooky – I can’t tell you how bad it was, so interesting though and full of fascinating and often very sad history. That looks to be a brilliant place to visit. History and atmosphere aplenty. I am sure it was really very interesting. I spent a night in Inverary Gaol a few years back as a fundraiser and definitely found those old cells to be creepy. 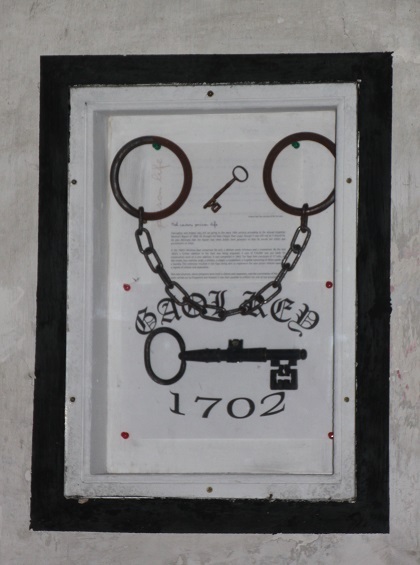 There is a historic jail here in Philly that we need to visit some time too. You’re braver than me Laura – I would not have wanted to spend a night in this place, it was creepy enough with other people around!! 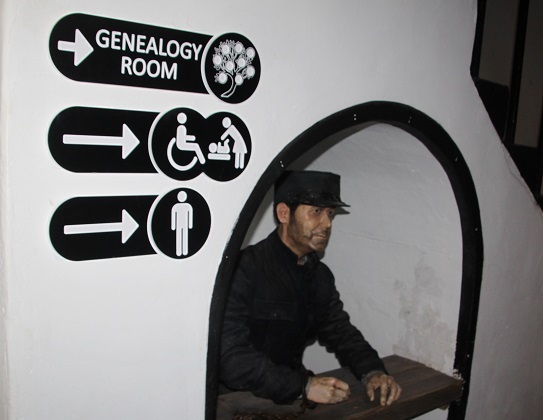 These kind of places though are very intriguing – they draw you in with their fascinating history. Must say this looks kind of amazing! So spooky, and so right up my alley. Your poor son in the last cell – at least it was the last one! I think if that had been the first cell he would never have stayed – he looked like a ghost when he came out!! It was super creepy but interesting too, we were glad to see daylight again though. Sounds like a god awful place. It was – an experience like no other! Gosh, this really does look spooky. 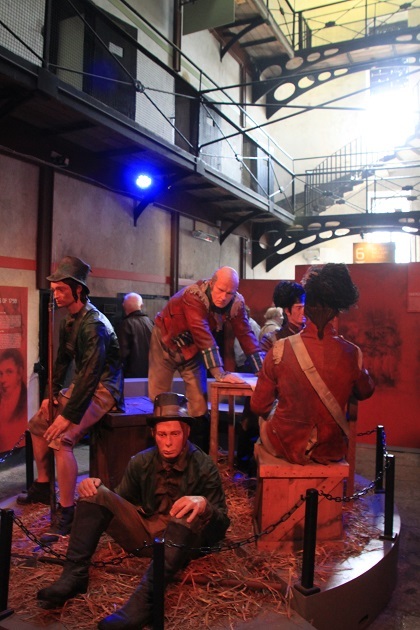 It reminded me of the old prison in Dublin but this here with all the figurines…. haunting! I haven’t been to the prison in Dublin Erika but heard that it is very interesting too. This place, creepy and spooky – we were glad to leave!! 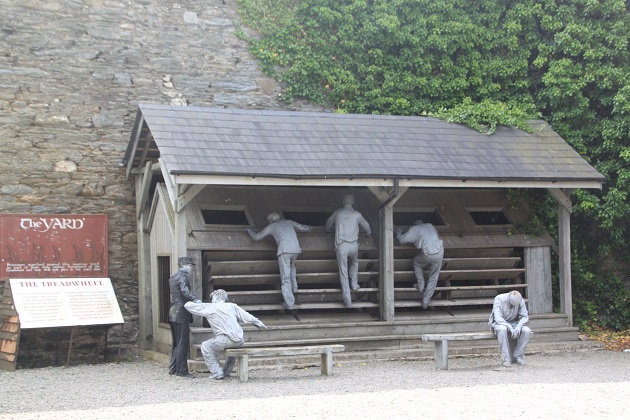 Wicklow’s jail looks much creepier than those I’ve visited in the US (Alcatraz in SF and Eastern State Penitentiary in Philadelphia) – both had some gory tales, but there was nothing particularly scary about either place. 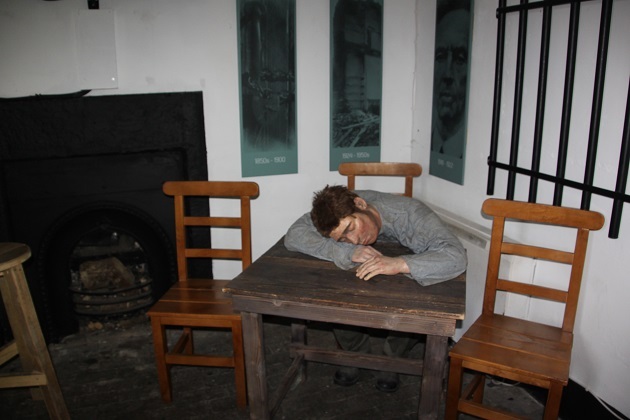 Those waxworks in Wicklow are ever so creepy – can’t blame your son for getting rather spooked as it does look like a very eerie place! I can picture this as an ideal location for Halloween events! I’ve been to Alcatraz too and found that fascinating, but you’re right Rosie it was nowhere near as creepy as this place. 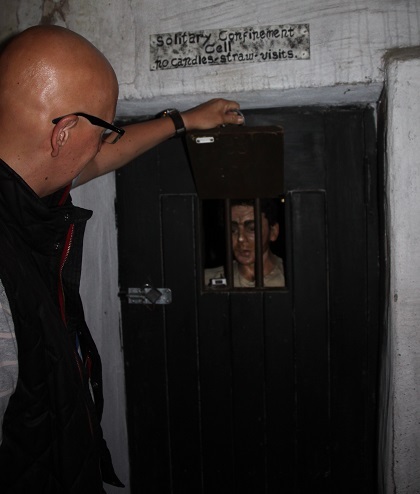 We visited the Crumlin Road Jail in Belfast a few years ago and the atmosphere in the condemned man’s cell was horrible but otherwise it was ok. 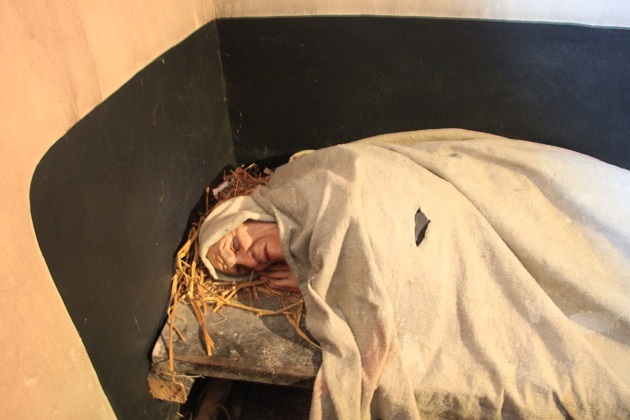 This place though was completely different – so spooky and so creepy throughout. Strange how prisons can differ so much in terms of spookiness – perhaps part of the reason Alcatraz isn’t so scary is that it’s so commercialised, whereas lesser-known jails open for public viewings may be home to more horrific stories that don’t become blockbusters and therefore appear more harrowing when read/listened to on tours such as those at Wicklow jail. It sounds an interesting place to visit. 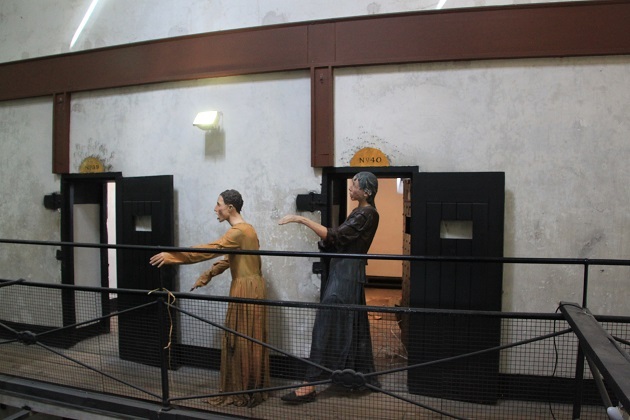 I like to hear about the history of these jails and the criminals who were held there, but it did sound a touch creepy especially with those Irish pensioners! It was dark, spooky and had a creepy atmosphere but was fascinating – the stories were intriguing and it was all so well done. I was glad to leave though!! What a spooky place Joy – fascinating and eerie all at the same time! It reminds me a bit of visiting Port Arthur in Tasmania years ago when our girls were small. Even though it was a warm summer’s day it felt cold and spooky somehow and this was just before the dreadful shootings a year so later there. Thank goodness for the jolly Irish pensioners! Hope you all slept ok that night! Fascinating descriptions and so interesting to read about all the history. A great post for Halloween week too!! It was so creepy Rosemary, I don’t know if it’s overactive imaginations or if there really is a strange atmosphere hanging over a place like this but I was spooked! It was fascinating though and the stories were all so interesting – we were all glad to get out into the fresh air again afterwards though!! That’s what I call a prison, no comfy beds, hot meals or colour TVs! The picture of the treadmill is my favourite! Definitely a deterrent to bad behaviour – the chance of being locked up in a place like this would definitely make people think twice! To be honest I don’t think I would like to go to prison even now! Me neither – I wouldn’t last 5 minutes!! So creepy I can’t tell you! Thanks for the great info and pix, now I know not to visit! I stopped watching scary movies years ago, this seems to be in the same category. It definitely is – I have never watched scary movies, always been a chicken so this place lingered in my imagination long after we’d left. Interesting but so creepy. Your reaction reminds me of my visit to Auschwitz. You could feel the evil still seeping out of the soil. Took me days to recover. The figures are very realistic! Spooky indeed! They made us jump more than a few times – you never quite got used to them! The figures look so real…I don’t blame Son, I would have been pale inside there! I have been to Alcatraz in SF and it was eerie, also! I think there is a strange and horrible atmosphere at any of those places probably Pam – we’ve been to a few prisons and I’ve always felt they were eerie – we found this interesting but were definitely glad to get back out into the fresh air! Great post. 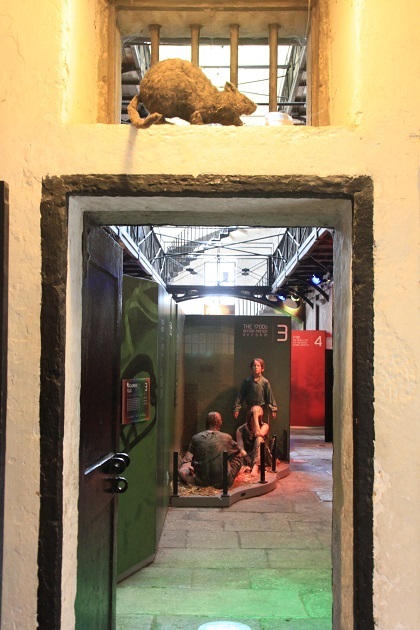 Have you ever toured Kilmainam Gaol in Dublin? It’s a great tour also. No, not yet but I definitely want to on our next Dublin visit! Wow, looks fascinating. Not to be undertaken by those of a frail disposition! Absolutely Denzil – it gave me the creeps properly!! Wasn’t intentional George but somehow it coincided with Hallowe’en!! It was a fascinating morning and the stories were compelling but creepy and very spooky – I was glad to be going back out again! Wow! What a creepy and horrifying place! I’m pretty sure that this one won’t end up on my list of must see places. LOL! You’re all very brave! We won’t be going back though!! 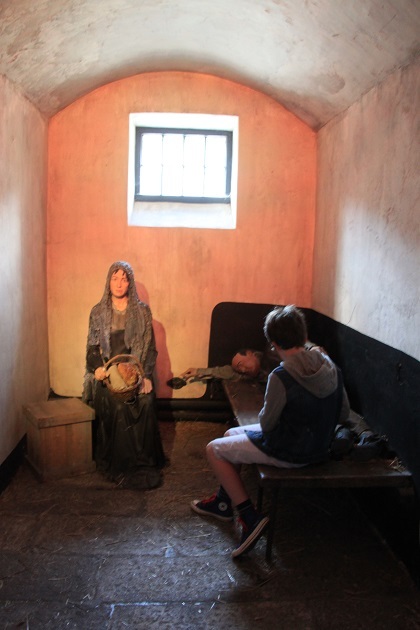 Never been to Cork Gaol but this had loads more waxworks than other jails we’ve been to in the past. It did make it so spooky and very realistic (too realistic!). It’s unimaginable isn’t it that they would send an 11 year old away like that with nobody and nothing. It was an interesting place but with a really strange atmosphere hanging over it, you could still almost sense all that misery. I believe you, I thought the pictures already reflected the feeling, must be more intensive when actually there!